The Yaesu FT-897D has the de-facto standard 6-pin Mini-DIN data jack on the back to which you can plug a digital modem. Amongst the pins it provides is a squelch status pin, and in the past I’ve tried using that to drive (via transistors) the carrier detect pin on various computer interfaces to enable the modem to detect when a signal is incoming. The FT-897D is fussy however. Any load at all pulling this pin down, and you get no audio. Any load. One really must be careful about that. Last week when I tried the UDRC-II, I hit the same problem. 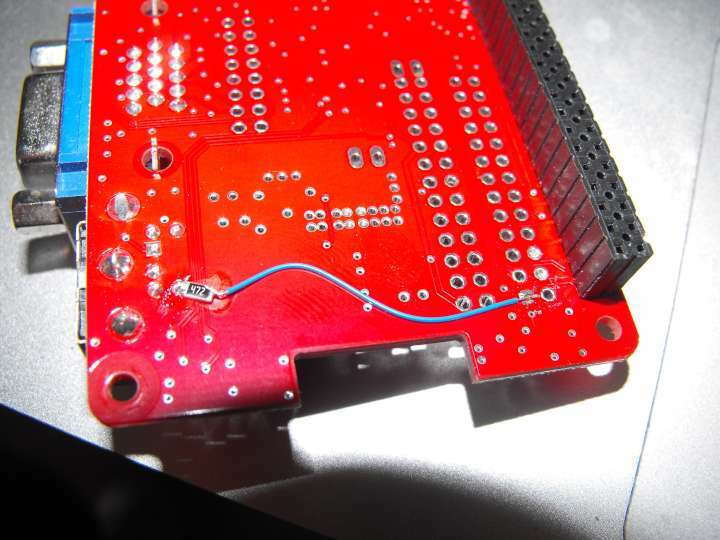 I was able to prove it was the UDRC-II by construction of a crude adapter cable that hooked up to the DB15-HD connector, converting that to Mini-DIN6: by avoiding the squelch status pin, I avoided the problem. One possible solution was to cut the supplied Mini-DIN6 cable open, locate the offending wire and cut it. Not a solution I relish doing. The other was to try and fix the UDRC-II. Discussing this on the list, it was suggested by Bryan Hoyer that I use a 4.7k pull-up resistor on the offending pin to 3.3V. He provided a diagram that indicated where to find the needed signals to tap into. With that information, I performed the following modification. A 1206 4.7k resistor is tacked onto the squelch status pin, and a small wire run from there to the 3.3V pin on a spare header. I’m at two minds whether this should be a diode instead, just in case a radio asserts +12V on this line, I don’t want +12V frying the SoC in the Raspberry Pi. On the other hand, this is working, it isn’t “broke”. Doing the above fixed the squelch drive issue and now I’m able to transmit and receive using the UDRC-II. Many thanks to Bryan Hoyer for pointing this modification out.